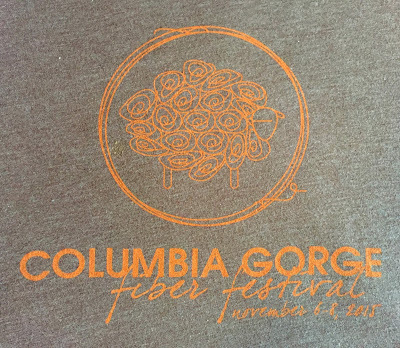 About 10 days ago, my mom and I attended the Columbia Gorge Fiber Festival - it was held in The Dalles, Oregon, which is near where my parents live. This was a belated Christmas gift from my parents, and it was worth the wait! 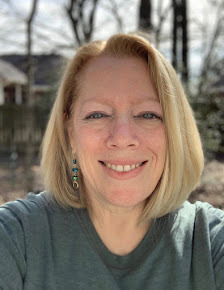 I got to take three knitting classes, attend the dinner banquet, sit and knit with friendly strangers, and of course, shop the Marketplace...everything a knitter could want! 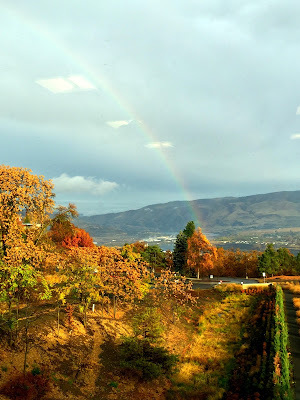 The CGFF started on a Friday morning, so I flew to Oregon on Wednesday. That took all dang day, as our flight out of Dallas had what turned out to be a non-issue regarding a hydraulic fluid leak, but the pilot wanted to be extra cautious, which of course I appreciated...better safe than sorry. When the delay stretched into a couple of hours, I was extra glad to have a buffer day of travel, just in case. Luckily I made it to Portland that night, and got to spend Thursday doing fun stuff with my mom. Packet pickup (just like a race, and of course I bought the festival t-shirt for both of us...it seemed fitting) began at 8:00 am on Friday, with classes beginning at 8:30 am, so we were up early for the 40 minute drive to the venue. My mom took an all-day class on fiber felting, which is what she's been into for the last few years (I'll have a post on that soon). Can you see the long pointy knitting needle sticking out of her waist belt? We were all laughing as she waved it around, like she was fencing without using her hands. At this point, she'd added her knitting project and was walking around, knitting and saying "en garde" in her lovely French accent - I was cracking up! She had us cast on and knit several rows of garter stitch while she was talking about the history of knitting, and then we did a speed test. Spoiler alert: I am not very fast...which I already knew. But she showed us how to count rows (you count the bars between your stitches, like in the upper right picture below), which I'd always been a little confused on. And she showed us a different way to wrap the yarn around our fingers so we wouldn't have to slow ourselves down by constantly rewrapping - her reminder for which fingers to use were "peace, rude, ring" which I took pictures of so I could better remember. Then we started lever knitting, using the 14-inch long knitting needles we each brought. It was interesting and definitely will take some practice - you can see in the bottom left picture how my gauge tightened up a lot over the last few rows, which were done lever-style. That is not particularly a good thing, but it comes with the territory of learning something new - I'm a tight knitter to begin with, so that part got worse the more I concentrated. Me, Lauralie, and John - happy shoppers! The next day I had another class with Stephanie, called Grok the Sock - it was another fascinating morning spent learning, and bettering, my sock techniques. We knitted up a little sock, and there was one point when I got stuck on picking up stitches for the heel (I hardly ever do a heel flap, so this was still tricky for me) and Stephanie worked her magic on my sock...my inner fangirl was squealing in delight - I have Yarn Harlot stitches on my little sock!!! I don't have a picture of the sock yet because I haven't finished it - I had another sock that I needed to work on while I was in Oregon. Soon, maybe even by the end of today, I'll get it done. Again, this class could have gone on all day and I'd have been a happy camper. If any of my knitting readers ever get a chance to take a class from Stephanie Pearl-McPhee, jump at it - you'll be happy you did. After more shopping at the Marketplace, we went to the dinner banquet, where GUESS WHO was the keynote speaker? If you guessed Stephanie Pearl-McPhee, you win. Wait, I won...along with everyone else in the room. She gave a great talk and was so funny that I was laughing so hard I was crying. It was wonderful. My mom's friend DonnaLee, me, my mom. Each of us wearing something we'd made. Centerpiece at the banquet - because of course! Perfect for our crowd. Rainbow on Sunday morning just before class began - view from our window. The last day of the CGFF had me taking a class with a different teacher - this one was called Patty's Bag of Tricks, taught by Patty Lyons. She went at the speed of light and I got a little frustrated at times because I'd get lost and she just kept moving on. She gave the class a break at the halfway point, and outside of the room, another knitter confided to me that she was lost, so I felt better (not gonna lie, a bag of M&M's from the nearby vending machine also helped)...but still, it was quite a different experience from my other two classes. Toward the end of the class Patty did say she was trying to cram six hours worth of information into the three hour class, and if that was the case, I'd rather have had less info but understood more of it. She gave us handouts of the tricks and techniques she was teaching us, which was a good thing because there wasn't time to take good notes. This is all the yarn I bought while in Oregon, but I didn't get it all at the CGFF - we managed to visit a few yarn shops while I was there, too. Most of it is sock yarn (no surprise there), but the aqua blue gradient kit will become a cowl for my mom at some point. 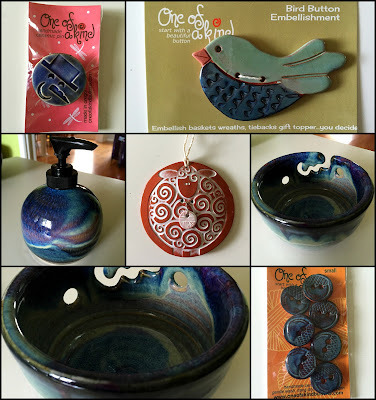 Non-yarn goodies include a hand-thrown pottery yarn bowl, a soap/lotion dispenser (both by Kunihiro Pottery), ceramic buttons (for a sweater that I've got the yarn for - just need to (wo)man up and start it), a giant bird button that I didn't exactly know what I'd do with, but I couldn't stop thinking about so I finally bought, a sheep ornament, and a cute snowman pin, all from One of a Kind. 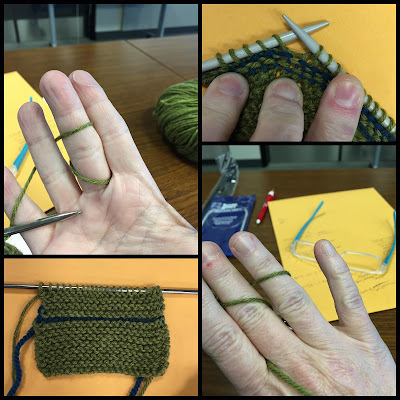 Stephania, from Three Fates Yarn, was in my Friday morning class. I loved her yarn and had such a hard time deciding which colorway to buy - finally went with this beautiful purple. My first time at a fiber festival was great fun and I am glad I got to do this, especially with my mom. We are already thinking about where to go next year! 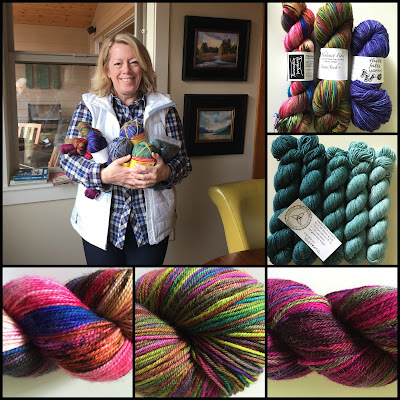 I am pea green with envy you got to meet the Yarn Harlot herself and take classes from her, plus go to a fiber festival! We don't have many fiber festivals down here in Florida but it is on my list of must do activity's soon! Awesome yarn haul you have there love the colors you chose. Wow I bet it is a little/lot over whelming to be among all that yarn at the market. I love to go to the stores and walk around and feel all the yarn, while only buying that which I came for with a coupon of course! I digress, it looks like you were having a great time and learning a lot and maybe speeding up your knitting don't feel bad I am slow too plus I use circulars now so it would seem strange and uncomfortable now to use straight needles of any size. Thanks for sharing with us! I knit on circulars, too - even when I'm not knitting in the round. But I will try the lever knitting when I'm making a baby blanket, or a sweater (if it's not done in the round). That looks like a great time and so cool that a hobby you ove to do has a festival. I love the pottery - so beautiful! Wow, that was a fun trip for you. You love knitting so much now so this festival was perfect for you and you got to meet your knitting idol. Really fun and I enjoyed reading it. OK, most of this was like a foreign language to me but your enthusiasm for all things fiber and yarn is infectious. You are absolutely beaming in the photos and I think it's just awesome that you got to share this with your mom! It was a great event - I really had a good time. LOL on the foreign language; I wondered if any non-knitters would even read this post, but as this blog is like a diary for me, I knew I had to write it all down even if a lot of it didn't make sense to most of my readers. What a wonderful trip you were able to share with your Mom!! I am drooling with envy that you got to do such an awesome festival! Okay, it was worth the wait! (still laughing at Helen's foreign language comment :) ) I am so glad that SPM lived up to your expectations--especially that she was funny! I've tried that pouch/lance system once after reading about it. I thought it would be so fun to knit while I was taking my walks… maybe if I'd had a class I would have had better luck. Love all the pottery you got, and love the yarn of course--my fav is the magenta with the royal blue streak in it--can't read the label, what is it? Wow, Stephania must be a tiny person--that much shorter than you? So so glad you had such a good time. 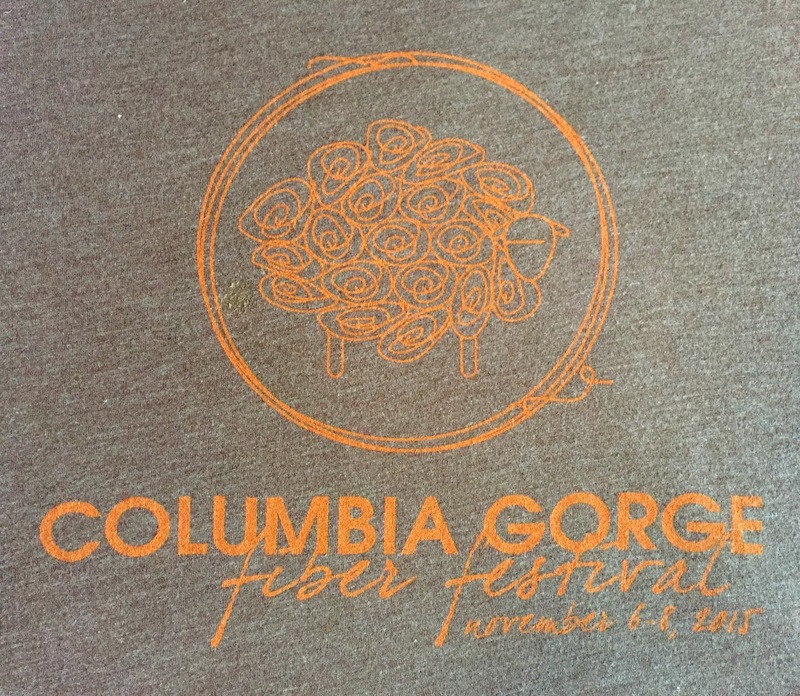 Wait, wasn't' there spinning at a fiber festival? Weren't you even tempted?? The yarn you like is from Thoroughly Thwacked - it was the first skein I bought, and the colors were just so wild that I knew I needed a pair of socks that would make me happy on a dreary gray winter's day. There's a girl form my area who ran the nYC marathon while finger knitting... just saying. This is so cool! This just goes to show that their is a "festival" for every interest! This is like us getting excited about a race weekend! That event is right you your alley! Love that you got to spend time with your Momma too - win/win! Oh Shelley!!!! How perfect for you!!!!!!! But wow, sounds like it was a great event! Love all the pictures and love that there is such a thing as a Yarn Harlot. Sounds like a fun crowd! Ha ha ha, when I read the title I thought this was fiber, like, in your food fiber, buah ha ha! This sounds SO FUN! I love that you went with your mom and her friend (who are total cuties btw - I see where you get it!). Loved reading this, it sounds likes so much fun and now I am reading your star struck knitters blog b/c you raved about it so much.